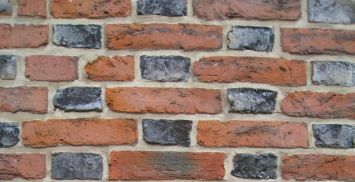 Since brickwork has been produced in England in the 15th century, potash (potassium carbonate salt) glazed brick have been used for decorative headers in diaper and from the 17th century Flemish Bond brick patterns. The glaze was a natural result of the stacking of the bricks and the use of wood fuel . However soon glaze or salt was used to enhance the effect. Silver grey bricks were produced in the 18th century and were popular in the early 20th century arts and crafts movement.